MHISolutionsmag.com—In recent years, fruits, vegetables and meat products have all been susceptible to some sort of scare. And for good reason. Each year, one in 10 Americans is sickened by food, and 400,000 die. Tracking down the cause of the contaminated product sometimes can take months. But, with blockchain starting to make its way into the food industry, the tracking process is undergoing some major changes. 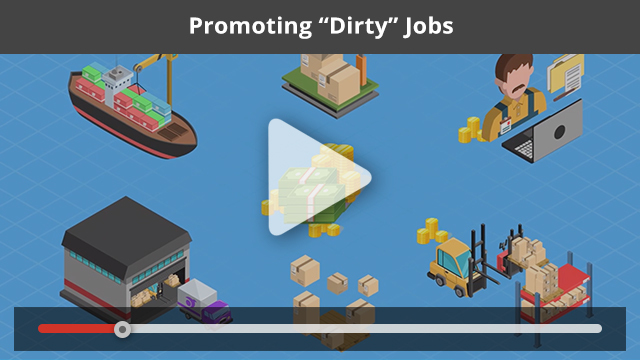 As part of MHI view's ongoing video program, this new episode focuses on Promoting “Dirty” Jobs. MHI Blog—MHI Industry Night at ProMat 2019 will feature entertainment by Craig Ferguson, a Scottish-American television host, comedian, author and actor. You might know Ferguson from hosting the American late-night talk show called Late Late Show, or for his role on the American game show Celebrity Name Game, but do you know these ten things about his life and career? MHISolutionsmag.com—Innovation and evolution don’t just happen. They are a result of continually challenging the boundaries and testing the unknown. That is where MHI’s Automated Storage/Retrieval Systems (AS/RS) Industry Group comes in—as far as automated solutions are concerned. The companies in this group are repeatedly questioning and challenging the limits in order to come up with innovative and cutting-edge technologies that will help everyone in the supply chain impacted by the capabilities of AS/RS equipment. Stanford Social Innovation Review—By making data easily verifiable, resistant to alteration, and instantly available to anyone within a network, the incorruptible digital ledgers known as blockchains can help ensure that commercial goods are ethically produced from mine to store. SupplyChain247—2019 is shaping up to be a year in which warehouses and distribution centers continue the development and implementation of technology-based processes, and technology will allow shippers to work smarter, faster and with fewer human resources. Global Trade Mag—Supply chain complexity has been growing for years and several of these trends threaten to create even more complexity, according to a report released by DHL. The trends explored are specific to the North American regions and focus on the greatest impact. Forbes—Predictions, especially ones that incorporate trends, technologies and political situations, are difficult to make. But, there are some markers that help strategists point in certain directions, and those markers are coming through loud and clear for 2019. Global uncertainty, climate change, BRICS countries, online retailing, 3D printing and blockchain are just some of the topics to make this list. Modern Materials Handling— Today's complex supply chains have many moving parts that can be difficult to synchronize, optimize and digitize. The question is where to start. Supply Chain Dive—Nearly every industry, at some point, faces product recalls. So, as a supply chain manager, knowing how to weather them is imperative. Traceability and inventory planning are two important first steps. Transport Topics—Truck platooning has not yet advanced beyond the testing and development stage, but proponents and developers of the technology continue to explore ways to eventually deploy it in real-world freight operations. Are Fleets Shifting to Electric Trucks or Sticking with Diesel? SupplyChainBrain—While electric trucks are making headlines, the competition will be a tough one when it comes to Class 8 heavy-duty trucks. Diesel has a strong following and supporters will expect some impressive statistics before contemplating electrification for their fleets. Freightwaves—Falling energy prices in December cooled inflation fears and restrained price gains, while trucking rates continued their upward drive fueled in large part by long-distance truck loads. Supply & Demand Chain Executive—Increased cost is the biggest challenge for businesses adopting sustainable supply chains, according to a recent survey by Economist Intelligence Unit and LLamasoft. Material Handling & Logistics—Successful leaders will require flexibility, digital champions and a willingness to test digital-first ways of growing retail sales globally.